When it comes to holiday decorations, I like to keep things simple and inexpensive. This year, per my son's request, I wanted to put up something for Valentine's Day before the big day arrived (typically I only decorate right on V-day). I decided to put my 2009 Snow & Graham calendar to use and die-cut hearts for a simple banner. I can never bring myself to throw away those calendars...they are so lovely (last year I made these). I put a needle and thread through the hearts and tied them to these itty bitty hooks screwed into the base of our mantle. Total cost: $1.37 (the cost of using the scrapbooking store's die-cut machine). And last: "grownup" Valentines I made alongside my children. 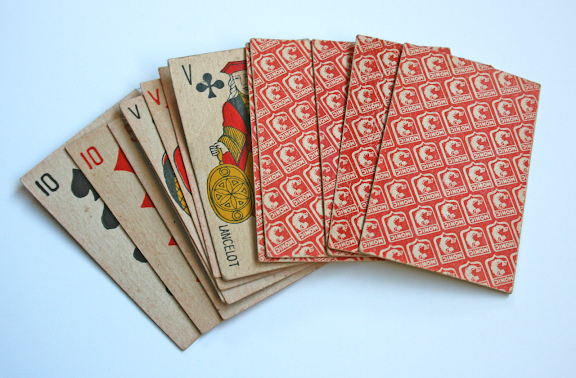 Last year when flea-marketing with Rachel in Paris, I found a stack of miniature vintage French playing cards for sale. After negotiating with the vendor for 10 or 15 minutes, he finally gave them to me for a decent price. I wasn't sure what to do with them until I spotted this tear in my inspiration binder. Playing-Card Valentines? Perfect. Especially since I already had a couple of glassine envelopes on hand (I'm all about trying to use up what I have to avoid unnecessary purchases). Two other simple favorites that I'm head-over-heels for....1. these brownie bags and 2. these miniature candy boxes. Both are not-to-be-missed and definitely worthy of a bookmark! oh my gosh those cards and banner are cute!! thanks for the fun ideas! So cute! And I just bookmarked those L'Amour cards on Etsy. 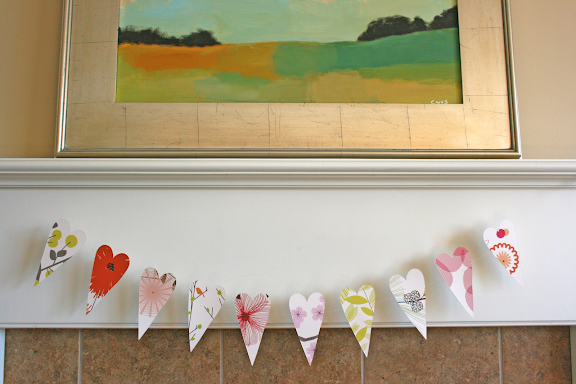 The paper heart chain on your mantle is super sweet! OH great idea! I have the same calendar sitting at my feet, as we speak! I am definitely making some cards out of them. The Indian themed calendar at papersource has templates on the back of the months for cutting into folders and all sorts of things when the year is done... is February too late to buy a calendar? i can never bear to throw out my calendars, either. i have that same snow & graham one. might have to borrow this idea! your heart garland is the dearest! i love it. you are so creative! These all look fabulous Steph! Great to see you found an idea for your cards too. I have to say, I first discovered your blog when La Maisonette was featured on Design Sponge, and I fell in love with it! I've started my own blog recently, and yours was a big inspiration. If you get a wild hair, you can find it at kendallsimmons.blogspot.com. Thanks for the link Steph..
so sweet, stephanie! 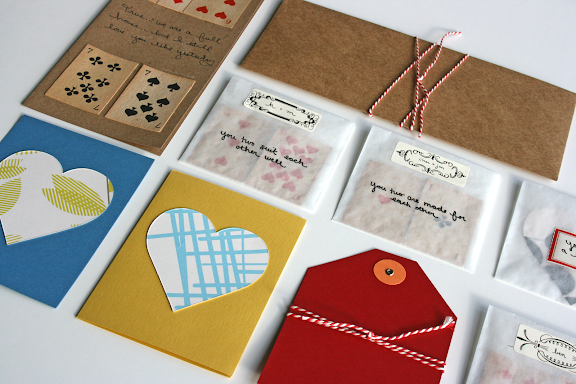 love your s&g repurposed paper garland and those vintage playing cards are amazing! Thanks for sharing your wonderful idea! Love using the old calendar. That's something I'd save forever in a drawer. Love the die-cut hearts and of course the homemade Valentines! Thanks for taking time to share such simple sweetness. Hugs from your fellow Lacanche owner!